L'AQUILA, Italy (CNN) -- President Obama declared the G-8 summit Friday "highly productive," writing off suggestions that the United States did not get some key things it wanted out of the meeting. 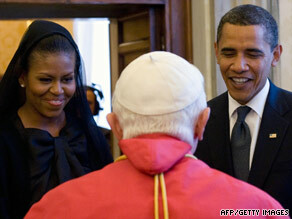 Pope Benedict speaks with President Obama and Michelle Obama during their visit to Rome on Friday. "We've agreed to take significant measures to address some of the most pressing threats facing our environment, our global economy, and our international security," Obama told reporters at a news conference. He denied reports that the United States had sought potential new sanctions against Iran for its violent crackdown on protesters after the recent presidential election. Instead, Obama said, "What we wanted was exactly what we got, which is a statement of unity and strong condemnation about the appalling treatment of peaceful protesters." He also noted that on climate change, the G-8 nations agreed to "reduce our emissions by 80 percent" -- though the deadline for such achievement was set for 2050. "We did not reach agreement on every issue. And we still have much work ahead on climate change," Obama said. "But these achievements are highly meaningful and they'll generate significant momentum" for future talks. A key part of that: an agreement to invest $20 billion to fight world hunger. Going into the meeting, the group had planned $15 billion. Obama said the change came in part due to a move on his part -- citing his own family background. "My father traveled to the United States a mere 50 years ago. And yet now I have family members who live in villages. They themselves are not going hungry, but live in villages where hunger is real. And so this is something that I understand in very personal terms," he said. Obama said he shared that with fellow G-8 leaders, and pointed to corruption and "lack of transparency" in much of Africa. "We've got 100 million people who dropped into further dire poverty as a consequence of this recession. We estimate that 1 billion people are hungry around the globe. And so, wealthier nations have a moral obligation as well as a national security interest in providing assistance. And we've got to meet those responsibilities. "The flip side is that countries in Africa and elsewhere in the world that are suffering from extreme poverty have an obligation to use the assistance that's available in a way that's transparent, accountable and that builds on rule of law and others that allow long-term improvement. There's no reason that Africa can't be self-sufficient when it comes to food." The message was a key move in laying the groundwork for the president's trip to Ghana, where he will head later in the day. While he has relatives in Kenya -- one of the African nations troubled by corruption -- Obama has made clear why he is selecting Ghana. "You've got there a functioning democracy, a president who is serious about reducing corruption, and you've seen significant economic growth," he said. While the president's trip is focused on a broad array of international issues, he said he remains focused on the current centerpiece of his domestic agenda: health care reform. "It is my highest legislative priority over the next month," he said. Even with concerns expressed by Republicans and a group of conservative Democrats about the potential cost of his plan to overhaul the health care system, Obama said his timeline for getting legislation passed in Congress has not shifted. "I really want to get it done by the August recess," he said. It was expected that the two would discuss sensitive topics on which the two disagree -- including abortion rights. The Obama family -- Christian, though not Catholic -- had a moment with the pope together. The pontiff gave the first family a blessing.